Nicolaus Copernicus (German: Nikolaus Kopernikus; Italian: Nicol Copernico ; 19 February 1473 – 24 May 1543) was a Renaissance mathematician and astronomer who formulated a heliocentric model of the universe which placed the Sun, rather than the Earth, at the center. Copernicus was born in Royal Prussia, a region of the Kingdom of Poland. He studied at the Jagiellonian University, Krakw, and subsequently at the Universities of Bologna, Padua and Ferrara. The publication of Copernicus’ book, De revolutionibus orbium coelestium (On the Revolutions of the Celestial Spheres), just before his death in 1543, is considered a major event in the history of science. It began the Copernican Revolution and contributed importantly to the rise of the ensuing Scientific Revolution. One of the great polymaths of the Renaissance, Copernicus was also a jurist with a doctorate in law, a physician, quadrilingual polyglot, classics scholar, translator, artist, governor, diplomat and economist who formulated Gresham’s Law in the year (1519) of Thomas Gresham’s birth. Nicolaus Copernicus was born on 19 February 1473 in the city of Torun (Thorn), in the province of Royal Prussia, in the Crown of the Kingdom of Poland. His father was a merchant from Krakuw and his mother was the daughter of a wealthy Torun merchant. Nicolaus was the youngest of four children. His brother Andreas (Andrew) became an Augustinian canon at Frombork (Frauenburg). His sister Barbara, named after her mother, became a Benedictine nun and, in her final years (she died after 1517), prioress of a convent in Chelmno (Kulm). His sister Katharina married the businessman and Torun city councilor Barthel Gertner and left five children, whom Copernicus looked after to the end of his life. Copernicus never married or had children. The fathers family can be traced to a village in Silesia near Nysa (Neise). The village’s name has been variously spelled Kopernik, Keppernig, Keppernick, and today Koperniki. In the 14th century, members of the family began moving to various other Silesian cities, to the Polish capital, Krakow (Cracow, 1367), and to Torun (1400). The father, likely the son of Jan, came from the Krakw line. Nicolaus was named after his father, who appears in records for the first time as a well-to-do merchant who dealt in copper, selling it mostly in Danzig (Gdansk). He moved from Krakw to Torun around 1458. Torun, situated on the Vistula River, was at that time embroiled in the Thirteen Years’ War (1454-66), in which the Kingdom of Poland and the Prussian Confederation, an alliance of Prussian cities, gentry and clergy, fought the Teutonic Order over control of the region. In this war Hanseatic cities like Danzig and Torun, the hometown of Nicolaus Copernicus, chose to support the Polish king, who promised to respect the cities’ traditional vast independence, which the Teutonic Order had challenged. Nicolaus’ father was actively engaged in the politics of the day and supported Poland and the cities against the Teutonic Order. In 1454 he mediated negotiations between Polands Cardinal Zbigniew Olesnicki and the Prussian cities for repayment of war loans. In the Second Peace of Thorn (1466), the Teutonic Order formally relinquished all claims to its western provinces, which as Royal Prussia remained a region of Poland for the next 300 years. The father married Barbara Watzenrode, the astronomer’s mother, between 1461 and 1464. He died sometime between 1483 and 1485. Upon the father’s death, young Nicolaus maternal uncle, Lucas Watzenrode the Younger (1447-1512), took the boy under his protection and saw to his education and career. Nicolaus mother, Barbara Watzenrode, was the daughter of Lucas Watzenrode the Elder and his wife Katherine (ne Modlibg). Not much is known about her life, but she is believed to have died when Nicolaus was a small boy. The Watzenrodes had come from the Schweidnitz (Swidnica) region of Silesia and had settled in Torun after 1360, becoming prominent members of the citys patrician class. Through the Watzenrodes’ extensive family relationships by marriage, they were related to wealthy families of Torun, Danzig and Elblag (Elbing), and to the prominent Czapski, Dzialynski, Konopacki and Koscielecki noble families. The Modlibgs (literally, in Polish, “Pray to God”) were a prominent Polish family who had been well known in Poland’s history since 1271. Lucas and Katherine had three children: Lucas Watzenrode the Younger, who would become Copernicus’ patron; Barbara, the astronomer’s mother; and Christina, who in 1459 married the merchant and mayor of Torun, Tiedeman von Allen. Lucas Watzenrode the Elder was well regarded in Torun as a devout man and honest merchant, and he was active politically. He was a decided opponent of the Teutonic Knights and an ally of Polish King Casimir IV Jagiellon. In 1453 he was the delegate from Torun at the Grudziadz (Graudenz) conference that planned to ally the cities of the Prussian Confederation with Casimir IV in their subsequent war against the Teutonic Knights. During the Thirteen Years’ War that ensued the following year, he actively supported the war effort with substantial monetary subsidies, with political activity in Torun and Danzig, and by personally fighting in battles at Lasin (Lessen) and Malbork (Marienburg). He died in 1462. Lucas Watzenrode the Younger, the astronomer’s maternal uncle and patron, was educated at the University of Krakw (now Jagiellonian University) and at the universities of Cologne and Bologna. He was a bitter opponent of the Teutonic Order, and its Grand Master once referred to him as “the devil incarnate”. In 1489 Watzenrode was elected Bishop of Warmia (Ermeland, Ermland) against the preference of King Casimir IV, who had hoped to install his own son in that seat. As a result, Watzenrode quarreled with the king until Casimir IVs death three years later. Watzenrode was then able to form close relations with three successive Polish monarchs: John I Albert, Alexander Jagiellon, and Sigismund I the Old. He was a friend and key advisor to each ruler, and his influence greatly strengthened the ties between Warmia and Poland proper. Watzenrode came to be considered the most powerful man in Warmia, and his wealth, connections and influence allowed him to secure Copernicus education and career as a canon at Frombork Cathedral. Copernicus is postulated to have spoken Latin, German, and Polish with equal fluency. He also spoke Greek and Italian. The vast majority of Copernicus surviving works are in Latin, which in his lifetime was the language of academia in Europe. Latin was also the official language of the Roman Catholic Church and of Poland’s royal court, and thus all of Copernicus correspondence with the Church and with Polish leaders was in Latin. There survive a few documents written by Copernicus in German. Martin Carrier mentions this as a reason to consider Copernicus native language to have been German. Other arguments are that Copernicus was born in a predominantly German-speaking town and that, while studying law at Bologna in 1496, he signed into the German natio (Natio Germanorum)a student organization which, according to its 1497 by-laws, was open to students of all kingdoms and states whose mother-tongue (“Muttersprache”) was German. However, according to French philosopher Alexandre Koyr, this in itself does not imply that Copernicus considered himself German, since students from Prussia and Silesia were routinely placed in that category, which carried certain privileges that made it a natural choice for German-speaking students, regardless of their ethnicity or self-identification. The surname likely had something to do with the local Silesian copper-mining industry, though some scholars assert that it may have been inspired by the dill plant (in Polish, “koperek” or “kopernik”) that grows wild in Silesia. As was to be the case with William Shakespeare a century later, numerous spelling variants of the name are documented for the astronomer and his relatives. The name first appeared as a place name in Silesia in the 13th century, where it was spelled variously in Latin documents. Copernicus “was rather indifferent about orthography”. During his childhood, the name of his father (and thus of the future astronomer) was recorded in Thorn asNiclas Koppernigk around 1480. At Krakew he signed his name “Nicolaus Nicolai de Torunia”. At Bologna in 1496, he registered in theMatricula Nobilissimi Germanorum Collegii resp. Annales Clarissimae Nacionis Germanorum of the Natio Germanica Bononiae as Dominus Nicolaus Kopperlingk de Thorn IX grosseti. At Padua, Copernicus signed his name “Nicolaus Copernik”, later as “Coppernicus”. He signed a self-portrait, a copy of which is now at Jagiellonian University, “N Copernic”. The astronomer Latinized his name to Coppernicus, generally with two “p”s (in 23 of 31 documents studied), but later in life he used a single “p”. On the title page of De revolutionibus, Rheticus published the name as (in the genitive, or possessive, case) “Nicolai Copernici”. Copernicus’ uncle Watzenrode maintained contacts with the leading intellectual figures in Poland and was a friend of the influential Italian-born humanist and Krakw courtier, Filippo Buonaccorsi. Watzenrode seems first to have sent young Copernicus to the St. John’s School at Thorn where he himself had been a master. Later, according to Armitage (some scholars differ), the boy attended the Cathedral School at Wloclawek, up the Vistula River from Thorn, which prepared pupils for entrance to the University of Krakw, Watzenrode’s alma mater in Poland’s capital. In the winter semester of 1491-92 Copernicus, as “Nicolaus Nicolai de Thuronia”, matriculated together with his brother Andrew at the University of Krakew (now Jagiellonian University). Copernicus began his studies in the Department of Arts (from the fall of 1491, presumably until the summer or fall of 1495) in the heyday of the Krakw astronomical-mathematical school, acquiring the foundations for his subsequent mathematical achievements. According to a later but credible tradition (Jan Brozek), Copernicus was a pupil of Albert Brudzewski, who by then (from 1491) was a professor of Aristotelian philosophy but taught astronomy privately outside the university; Copernicus became familiar with Brozek’s widely read commentary to Georg von Peuerbach’s Theoric nov planetarum and almost certainly attended the lectures of Bernard of Biskupie and Wojciech Krypa of Szamotuly and probably other astronomical lectures by Jan of Glogw, Michael of Wroclaw (Breslau), Wojciech of Pniewy and Marcin Bylica of Olkusz. Copernicus’ Krakw studies gave him a thorough grounding in the mathematical-astronomical knowledge taught at the university (arithmetic, geometry, geometric optics, cosmography, theoretical and computational astronomy), a good knowledge of the philosophical and natural-science writings of Aristotle ( De coelo, Metaphysics), stimulated his interest in learning, and made him conversant with humanistic culture. Copernicus broadened the knowledge that he took from the university lecture halls with independent reading of books that he acquired during his Krakew years (Euclid, Haly Abenragel, the Alfonsine Tables, Johannes Regiomontanus’ Tabulae directionum); to this period, probably, also date his earliest scientific notes, now preserved partly at Uppsala University. At Krakw Copernicus began collecting a large library on astronomy; it would later be carried off as war booty by the Swedes during the Deluge (mid-1600s) and is now at the Uppsala University Library. Copernicus’ four years at Krakw played an important role in the development of his critical faculties and initiated his analysis of the logical contradictions in the two most popular systems of astronomy Aristotle’s theory of homocentric spheres, and Ptolemy’s mechanism of eccentrics and epicycles the surmounting and discarding of which constituted the first step toward the creation of Copernicus’ own doctrine of the structure of the universe. Without taking a degree, probably in the fall of 1495, Copernicus left Krakw for the court of his uncle Watzenrode, who in 1489 had been elevated to Prince-Bishop of Warmia and soon (after November 1495) sought to place his nephew in a Warmia canonry vacated by 26 August 1495 death of its previous tenant. For unclear reasons probably due to opposition from part of the chapter, who appealed to Rome Copernicus’ installation was delayed, inclining Watzenrode to send both his nephews to study law in Italy, seemingly with a view to furthering their ecclesiastic careers and thereby also strengthening his own influence in the Warmia chapter. Leaving Warmia in mid-1496 possibly with the retinue of the chapter’s chancellor, Jerzy Pranghe, who was going to Italy in the fall (October?) of that year Copernicus arrived in Bologna and a few months later (after 6 January 1497) signed himself into the register of the Bologna University of Jurists’ “German nation”, which also included Polish youths from Silesia, Prussia and Pomerania as well as students of other nationalities. It was only on 20 October 1497 that Copernicus, by proxy, formally succeeded to the Warmia canonry, which had been granted to him two years earlier. To this, by a document dated 10 January 1503 at Padua, he would add a sinecure at the Collegiate Church of the Holy Cross in Wroclaw, Silesia, Bohemia. Despite having received a papal indult on 29 November 1508 to receive further benefices, through his ecclesiastic career Copernicus not only did not acquire further prebends and higher stations (prelacies) at the chapter, but in 1538 he relinquished the Breslau sinecure. It is uncertain whether he was ordained a priest; he may only have taken minor orders, which sufficed for assuming a chapter canonry. During his three-year stay at Bologna, between fall 1496 and spring 1501, Copernicus seems to have devoted himself less keenly to studying canon law (he received his doctorate in law only after seven years, following a second return to Italy in 1503) than to studying the humanities–probably attending lectures by Filippo Beroaldo, Antonio Urceo, called Codro, Giovanni Garzoni and Alessandro Achillini–and to studying astronomy. He met the famous astronomer Domenico Maria Novara da Ferrara and became his disciple and assistant. Copernicus was developing new ideas inspired by reading the “Epitome of the Almagest” (Epitome in Almagestum Ptolemei) by George von Peuerbach and Johannes Regiomontanus (Venice, 1496). He verified its observations about certain peculiarities in Ptolemy’s theory of the Moon’s motion, by conducting on 9 March 1497 at Bologna a memorable observation of Aldebaran, the brightest star in the Taurus constellation, whose results reinforced his doubts as to the geocentric system. Copernicus the humanist sought confirmation for his growing doubts through close reading of Greek and Latin authors (Pythagoras, Aristarchos of Samos, Cleomedes, Cicero, Pliny the Elder, Plutarch, Philolaus, Heraclides, Ecphantos, Plato), gathering, especially while at Padua, fragmentary historic information about ancient astronomical, cosmological and calendar systems. Copernicus spent the jubilee year 1500 in Rome, where he arrived with his brother Andrew that spring, doubtless to perform an apprenticeship at the Papal Curia. Here, too, however, he continued his astronomical work begun at Bologna, observing, for example, a lunar eclipse on the night of 5-6 November 1500. According to a later account by Rheticus, Copernicus also probably privately, rather than at the Roman Sapienza–as a ” Professor Mathematum” (professor of astronomy) delivered, “to numerous… students and… leading masters of the science”, public lectures devoted probably to a critique of the mathematical solutions of contemporary astronomy. On his return journey doubtless stopping briefly at Bologna, in mid-1501 Copernicus arrived back in Warmia. After on 28 July receiving from the chapter a two-year extension of leave in order to study medicine (since “he may in future be a useful medical advisor to our Reverend Superior and the gentlemen of the chapter”), in late summer or in the fall he returned again to Italy, probably accompanied by his brother Andrew and by Canon B. Sculteti. This time he studied at the University of Padua, famous as a seat of medical learning, and except for a brief visit to Ferrara in May June 1503 to pass examinations for, and receive, his doctorate in canon law he remained at Padua from fall 1501 to summer 1503. Copernicus studied medicine probably under the direction of leading Padua professors Bartolomeo da Montagnana, Girolamo Fracastoro, Gabriele Zerbi, Alessandro Benedetti and read medical treatises that he acquired at this time, by Valescus de Taranta, Jan Mesue, Hugo Senensis, Jan Ketham, Arnold de Villa Nova, and Michele Savonarola, which would form the embryo of his later medical library. As at Bologna, Copernicus did not limit himself to his official studies. It was probably the Padua years that saw the beginning of his Hellenistic interests. He familiarized himself with Greek language and culture with the aid of Theodorus Gaza’s grammar (1495) and J.B. Chrestonius’ dictionary (1499), expanding his studies of antiquity, begun at Bologna, to the writings of Bessarion, J. Valla and others. There also seems to be evidence that it was during his Padua stay that there finally crystallized the idea of basing a new system of the world on the movement of the Earth. As the time approached for Copernicus to return home, in spring 1503 he journeyed to Ferrara where, on 31 May 1503, having passed the obligatory examinations, he was granted the degree of doctor of canon law. No doubt it was soon after (at latest, in fall 1503) that he left Italy for good to return to Warmia. Having completed all his studies in Italy, 30-year-old Copernicus returned to Warmia, where apart from brief journeys to Krakew and to nearby Prussian cities (Thorn, Danzig, Elbing, Graudenz, Malbork Marienburg, Knigsberg (Krlewiec) he would live out the remaining 40 years of his life. In 1504-12 Copernicus made numerous journeys as part of his uncle’s retinue in 1504, to Torun and Danzig, to a session of the Royal Prussian Council in the presence of Poland’s King Alexander Jagiellon; to sessions of the Prussian diet at Malbork (1506), Elblag (1507) and Sztum (Stuhm) (1512); and he may have attended a Poznan (Posen) session (1510) and the coronation of Poland’s King Sigismund I the Old in Krakw (1507). Watzenrode’s itinerary suggests that in spring 1509 Copernicus may have attended the Krakw sejm. It was probably on the latter occasion, in Krakw, that Copernicus submitted for printing at Jan Haller’s press his translation, from Greek to Latin, of a collection, by the 7th-century Byzantine historian Theophylact Simocatta, of 85 brief poems called Epistles, or letters, supposed to have passed between various characters in a Greek story. They are of three kinds”moral,” offering advice on how people should live; “pastoral”, giving little pictures of shepherd life; and “amorous”, comprising love poems. They are arranged to follow one another in a regular rotation of subjects. Copernicus had translated the Greek verses into Latin prose, and he now published his version as Theophilacti scolastici Simocati epistolae morales, rurales et amatoriae interpretatione latina, which he dedicated to his uncle in gratitude for all the benefits he had received from him. With this translation, Copernicus declared himself on the side of the humanists in the struggle over the question whether Greek literature should be revived. Copernicus’ first poetic work was a Greek epigram, composed probably during a visit to Krakew, for Johannes Dantiscus’ epithalamium for Barbara Zapolya’s 1512 wedding to King Zygmunt I the Old. Some time before 1514, Copernicus wrote an initial outline of his heliocentric theory known only from later transcripts, by the title (perhaps given to it by a copyist), Nicolai Copernici de hypothesibus motuum coelestium a se constitutis commentarioluscommonly referred to as the Commentariolus. It was a succinct theoretical description of the world’s heliocentric mechanism, without mathematical apparatus, and differed in some important details of geometric construction from De revolutionibus; but it was already based on the same assumptions regarding Earth’s triple motions. The Commentariolus, which Copernicus consciously saw as merely a first sketch for his planned book, was not intended for printed distribution. He made only a very few manuscript copies available to his closest acquaintances, including, it seems, several Krakew astronomers with whom he collaborated in 1515-30 in observing eclipses. Tycho Brahe would include a fragment from the Commentariolus in his own treatise, Astronomiae instauratae progymnasmata, published in Prague in 1602, based on a manuscript that he had received from the Bohemian physician and astronomer Tade Hjek, a friend of Rheticus. The Commentariolus would appear complete in print for the first time only in 1878. In 1510 or 1512 Copernicus moved to Frombork, a town to the northwest at the Vistula Lagoon on the Baltic Sea coast. There, in April 1512, he participated in the election of Fabian of Lossainen as Prince-Bishop of Warmia. It was only in early June 1512 that the chapter gave Copernicus an “external curia”a house outside the defensive walls of the cathedral mount. In 1514 he purchased the northwestern tower within the walls of the Frombork stronghold. He would maintain both these residences to the end of his life, despite the devastation of the chapter’s buildings by a raid against Frauenburg carried out by the Teutonic Order in January 1520, during which Copernicus’ astronomical instruments were probably destroyed. Copernicus conducted astronomical observations in 1513-16 presumably from his external curia; and in 1522-43, from an unidentified “small tower”, using primitive instruments modeled on ancient ones the quadrant, triquetrum, armillary sphere. At Frombork Copernicus conducted over half of his more than 60 registered astronomical observations. Having settled permanently at Frombork, where he would reside to the end of his life, with interruptions in 1516-19 and 1520-21, Copernicus found himself at the Warmia chapter’s economic and administrative center, which was also one of Warmia’s two chief centers of political life. In the difficult, politically complex situation of Warmia, threatened externally by the Teutonic Order’s aggressions (attacks by Teutonic bands; the Polish-Teutonic War of 1519-21; Albert’s plans to annex Warmia), internally subject to strong separatist pressures (the selection of the prince-bishops of Warmia; currency reform), he, together with part of the chapter, represented a program of strict cooperation with the Polish Crown and demonstrated in all his public activities (the defense of his country against the Order’s plans of conquest; proposals to unify its monetary system with the Polish Crown’s; support for Poland’s interests in the Warmia dominion’s ecclesiastic administration) that he was consciously a citizen of the Polish-Lithuanian Republic. Soon after the death of uncle Bishop Watzenrode, he participated in the signing of the Second Treaty of Piotrkw Trybunalski (7 December 1512), governing the appointment of the Bishop of Warmia, declaring, despite opposition from part of the chapter, for loyal cooperation with the Polish Crown. That same year (before 8 November 1512) Copernicus assumed responsibility, as magister pistoriae, for administering the chapter’s economic enterprises (he would hold this office again in 1530), having already since 1511 fulfilled the duties of chancellor and visitor of the chapter’s estates. His administrative and economic dutes did not distract Copernicus, in 1512-15, from intensive observational activity. The results of his observations of Mars and Saturn in this period, and especially a series of four observations of the Sun made in 1515, led to discovery of the variability of Earth’s eccentricity and of the movement of the solar apogee in relation to the fixed stars, which in 1515-19 prompted his first revisions of certain assumptions of his system. Some of the observations that he made in this period may have had a connection with a proposed reform of the Julian calendar made in the first half of 1513 at the request of the Bishop of Fossombrone, Paul of Middelburg. Their contacts in this matter in the period of the Fifth Lateran Council were later memorialized in a complimentary mention in Copernicus’ dedicatory epistle in De revolutionibus orbium coelestium and in a treatise by Paul of Middelburg, Secundum compendium correctionis Calendarii (1516), which mentions Copernicus among the learned men who had sent the Council proposals for the calendar’s emendation. During 1516-21, Copernicus resided at Olsztyn (Allenstein) Castle as economic administrator of Warmia, including Olsztyn (Allenstein) and Pieniezno (Mehlsack). While there, he wrote a manuscript, Locationes mansorum desertorum (Locations of Deserted Fiefs), with a view to populating those fiefs with industrious farmers and so bolstering the economy of Warmia. When Olsztyn was besieged by the Teutonic Knights during the Polish Teutonic War (1519-21), Copernicus directed the defense of Olsztyn and Warmia by Royal Polish forces. He also represented the Polish side in the ensuing peace negotiations. Copernicus worked for years with the Royal Prussian diet, and with Duke Albert of Prussia (against whom Copernicus had defended Warmia in the Polish-Teutonic War), and advised King Sigismund, on monetary reform. He participated in discussions in the Ducal Prussian diet about coinage reform in the Prussian countries; a question that concerned the diet was who had the right to mint coin. Political developments in Prussia culminated in the 1525 establishment of the Duchy of Prussia as a Protestant state in vassalage to Poland. In 1526 Copernicus wrote a study on the value of money, Monetae cudendae ratio. In it he formulated an early iteration of the theory, now called Gresham’s Law, that “bad” (debased) coinage drives “good” (un-debased) coinage out of circulation several decades before Thomas Gresham. He also formulated a version of quantity theory of money. Copernicus’ recommendations on monetary reform were widely read by leaders of both Prussia and Poland in their attempts to stabilize currency. In 1533, Johann Widmanstetter, secretary to Pope Clement VII, explained Copernicus’ heliocentric system to the Pope and two cardinals. The Pope was so pleased that he gave Widmanstetter a valuable gift. In 1535 Bernard Wapowski wrote a letter to a gentleman in Vienna, urging him to publish an enclosed almanac, which he claimed had been written by Copernicus. This is the only mention of a Copernicus almanac in the historical records. The “almanac” was likely Copernicus’ tables of planetary positions. Wapowski’s letter mentions Copernicus’ theory about the motions of the earth. Nothing came of Wapowski’s request, because he died a couple of weeks later. Following the death of Prince-Bishop of Warmia Mauritius Ferber (1 July 1537), Copernicus participated in the election of his successor, Johannes Dantiscus (20 September 1537). Copernicus was one of four candidates for the post, written in at the initiative of Tiedemann Giese; but his candidacy was actually pro forma, since Dantiscus had earlier been named coadjutor bishop to Ferber. At first Copernicus maintained friendly relations with the new Prince-Bishop, assisting him medically in spring 1538 and accompanying him that summer on an inspection tour of Chapter holdings. But that autumn, their friendship was strained by suspicions over Copernicus’ housekeeper, Anna Schilling, whom Dantiscus removed from Frombork in 1539. In his younger days, Copernicus the physician had treated his uncle, brother and other chapter members. In later years he was called upon to attend the elderly bishops who in turn occupied the see of Warmia Mauritius Ferber and Johannes Dantiscus and, in 1539, his old friend Tiedemann Giese, Bishop of Chelmno (Kulm). In treating such important patients, he sometimes sought consultations from other physicians, including the physician to Duke Albert and, by letter, the Polish Royal Physician. In the spring of 1541, Duke Albert summoned Copernicus to Knigsberg to attend the Duke’s counselor, George von Kunheim, who had fallen seriously ill, and for whom the Prussian doctors seemed unable to do anything. Copernicus went willingly; he had met von Kunheim during negotiations over reform of the coinage. And Copernicus had come to feel that Albert himself was not such a bad person; the two had many intellectual interests in common. The Chapter readily gave Copernicus permission to go, as it wished to remain on good terms with the Duke, despite his Lutheran faith. In about a month the patient recovered, and Copernicus returned to Frombork. For a time, he continued to receive reports on von Kunheim’s condition, and to send him medical advice by letter. Throughout this period of his life, Copernicus continued making astronomical observations and calculations, but only as his other responsibilities permitted and never in a professional capacity. Some of Copernicus’ close friends turned Protestant, but Copernicus never showed a tendency in that direction. The first attacks on him came from Protestants. Wilhelm Gnapheus, a Dutch refugee settled in Elblag, wrote a comedy in Latin, Morosophus (The Foolish Sage), and staged it at the Latin school that he had established there. In the play, Copernicus was caricatured as a haughty, cold, aloof man who dabbled in astrology, considered himself inspired by God, and was rumored to have written a large work that was moldering in a chest. Some people believe that it is excellent and correct to work out a thing as absurd as did that Sarmatian astronomer who moves the earth and stops the sun. Indeed, wise rulers should have curbed such light-mindedness. Nevertheless, in 1551, eight years after Copernicus’ death, astronomer Erasmus Reinhold published, under the sponsorship of Copernicus’ former military adversary, the Protestant Duke Albert, the Prussian Tables, a set of astronomical tables based on Copernicus’ work. Astronomers and astrologers quickly adopted it in place of its predecessors. Some time before 1514 Copernicus made available to friends his “Commentariolus” (“Little Commentary”), a forty-page manuscript describing his ideas about the heliocentric hypothesis. It contained seven basic assumptions (detailed below). Thereafter he continued gathering data for a more detailed work. By then Copernicus’ work was nearing its definitive form, and rumors about his theory had reached educated people all over Europe. Despite urgings from many quarters, Copernicus delayed publication of his book, perhaps from fear of criticism a fear delicately expressed in the subsequent dedication of his masterpiece to Pope Paul III. Scholars disagree on whether Copernicus’ concern was limited to possible astronomical and philosophical objections, or whether he was also concerned about religious objections. 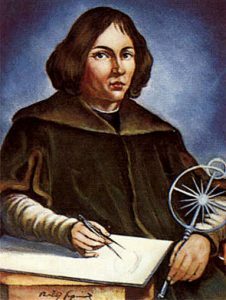 Copernicus was still working on De revolutionibus orbium coelestium (even if not certain that he wanted to publish it) when in 1539 Georg Joachim Rheticus, a Wittenberg mathematician, arrived in Frombork. Philipp Melanchthon, a close theological ally of Martin Luther, had arranged for Rheticus to visit several astronomers and study with them. Rheticus became Copernicus’ pupil, staying with him for two years and writing a book, Narratio prima (First Account), outlining the essence of Copernicus’ theory. In 1542 Rheticus published a treatise on trigonometry by Copernicus (later included in the second book of De revolutionibus). Under strong pressure from Rheticus, and having seen the favorable first general reception of his work, Copernicus finally agreed to give De revolutionibus to his close friend, Tiedemann Giese, bishop of Chelmno (Kulm), to be delivered to Rheticus for printing by the German printer Johannes Petreius at Nuremberg (Nurnberg), Germany. While Rheticus initially supervised the printing, he had to leave Nuremberg before it was completed, and he handed over the task of supervising the rest of the printing to a Lutheran theologian, Andreas Osiander. Osiander added an unauthorised and unsigned preface, defending the work against those who might be offended by the novel hypotheses. He explained that astronomers may find different causes for observed motions, and choose whatever is easier to grasp. As long as a hypothesis allows reliable computation, it does not have to match what a philosopher might seek as the truth. Philolaus (c. 480-385 BCE) described an astronomical system in which a Central Fire (different from the Sun) occupied the centre of the universe, and a counter-Earth, the Earth, Moon, the Sun itself, planets, and stars all revolved around it, in that order outward from the centre. Heraclides Ponticus (387-312 BCE) proposed that the Earth rotates on its axis. Aristarchus of Samos (310 BCE c. 230 BCE) identified the “central fire” with the Sun, around which he had the Earth orbiting. Some technical details of Copernicus’s system closely resembled those developed earlier by the Islamic astronomers Na?ir al-Din al-?usi and Ibn al-Sha?ir, both of whom retained a geocentric model. Aryabhata (476-550), in his magnum opus Aryabhatiya (499), propounded a planetary model in which the Earth was taken to be spinning on its axis and the periods of the planets were given with respect to the Sun. He accurately calculated many astronomical constants, such as the periods of the planets, times of the solar and lunar eclipses, and the instantaneous motion of the Moon. At the Maragha observatory, Najm al-Din al-Qazwini al-Katibi (d. 1277), in his Hikmat al-‘Ain, wrote an argument for a heliocentric model, but later abandoned the model. Qutb al-Din Shirazi (b. 1236) also discussed the possibility of heliocentrism, but rejected it. Ibn al-Shatir (b. 1304) developed a geocentric system that employed mathematical techniques, such as the Tusi-couple and Urdi lemma, that were almost identical to those Nicolaus Copernicus later employed in his heliocentric system, implying that its mathematical model was influenced by the Maragha school. Nilakantha Somayaji (1444-1544), in his Aryabhatiyabhasya, a commentary on Aryabhata’s Aryabhatiya, developed a computational system for a partially heliocentric planetary model, in which the planets orbit the Sun, which in turn orbits the Earth, similar to the Tychonic system later proposed by Tycho Brahe in the late 16th century. In the Tantrasangraha (1500), he further revised his planetary system, which was mathematically more accurate at predicting the heliocentric orbits of the interior planets than both the Tychonic and Copernican models. The prevailing theory in Europe during Copernicus’ lifetime was the one that Ptolemy published in his Almagest circa 150 CE; the Earth was the stationary center of the universe. Stars were embedded in a large outer sphere which rotated rapidly, approximately daily, while each of the planets, the Sun, and the Moon were embedded in their own, smaller spheres. Ptolemy’s system employed devices, including epicycles, deferents and equants, to account for observations that the paths of these bodies differed from simple, circular orbits centered on the Earth. Copernicus’ major theory was published in De revolutionibus orbium coelestium (On the Revolutions of the Celestial Spheres), in the year of his death, 1543, though he had formulated the theory several decades earlier. Georg Joachim Rheticus could have been Copernicus’ successor, but did not rise to the occasion. Erasmus Reinhold could have been his successor, but died prematurely. The first of the great successors was Tycho Brahe (though he did not think the earth orbited the sun), followed by Johannes Kepler, who had worked as Tycho’s assistant in Prague. Despite the near universal acceptance today of the basic heliocentric idea (though not the epicycles or the circular orbits), Copernicus’ theory was originally slow to catch on. Scholars hold that sixty years after the publication of The Revolutions there were only around 15 astronomers espousing Copernicanism in all of Europe, “Thomas Digges and Thomas Hariot in England; Giordano Bruno and Galileo Galilei in Italy; Diego de Zuniga in Spain; Simon Stevin in the Low Countries; and in Germany, the largest group Georg Joachim Rheticus, Michael Maestlin, Christoph Rothmann (who may have later recanted), and Johannes Kepler.” Additional possibilities are Englishman William Gilbert, along with Achilles Gasser, Georg Vogelin, Valentin Otto, and Tiedemann Giese. Arthur Koestler, in his popular book The Sleepwalkers, asserted that Copernicus’ book had not been widely read on its first publication. This claim was trenchantly criticised by Edward Rosen, and has been decisively disproved by Owen Gingerich, who examined every surviving copy of the first two editions and found copious marginal notes by their owners throughout many of them. Gingerich published his conclusions in 2004 in The Book Nobody Read. Toward the close of 1542, Copernicus was seized with apoplexy and paralysis, and he died at age 70 on 24 May 1543. Legend has it that he was presented with an advance copy of his De revolutionibus orbium coelestium on the very day that he died, allowing him to take farewell of his life’s work. He is reputed to have awoken from a stroke-induced coma, looked at his book, and then died peacefully. Copernicus was reportedly buried in Frombork Cathedral, where archaeologists for over two centuries searched in vain for his remains. Efforts to locate the remains in 1802, 1909, 1939 and 2004 had come to nought. In August 2005, however, a team led by Jerzy Gassowski, head of an archaeology and anthropology institute in Pultusk, after scanning beneath the cathedral floor, discovered what they believed to be Copernicus’ remains. The find came after a year of searching, and the discovery was announced only after further research, on 3 November 2008. Gassowski said he was “almost 100 percent sure it is Copernicus”. Forensic expert Capt. Dariusz Zajdel of the Polish Police Central Forensic Laboratory used the skull to reconstruct a face that closely resembled the features including a broken nose and a scar above the left eye on a Copernicus self-portrait. The expert also determined that the skull belonged to a man who had died around age 70 Copernicus’ age at the time of his death. On 22 May 2010 Copernicus was given a second funeral in a Mass led by Juzef Kowalczyk, the former papal nuncio to Poland and newly named Primate of Poland. Copernicus’ remains were reburied in the same spot in Frombork Cathedral where part of his skull and other bones had been found. A black granite tombstone now identifies him as the founder of the heliocentric theory and also a church canon. The tombstone bears a representation of Copernicus’ model of the solar system a golden sun encircled by six of the planets. There has been discussion of Copernicus’ nationality and of whether, in fact, it is meaningful to ascribe to him a nationality in the modern sense. Historian Michael Burleigh describes the nationality debate as a “totally insignificant battle” between German and Polish scholars during the interwar period. According to Czeslaw Milosz, the debate is an “absurd” projection of a modern understanding of nationality onto Renaissance people, who identified with their home territories rather than with a nation. Similarly historian Norman Davies writes that Copernicus, as was common in his era, was “largely indifferent” to nationality, being a local patriot who considered himself “Prussian”. The Stanford Encyclopedia of Philosophy describes Copernicus as a “child of a German family was a subject of the Polish crown”, while others note that his father was a Germanized Pole. Encyclopedia Britannica, Encyclopedia Americana, The Columbia Encyclopedia and The Oxford World Encyclopedia identify Copernicus as a “Polish astronomer”. On 14 July 2009, the discoverers, from the Gesellschaft fur Schwerionenforschung in Darmstadt, Germany, of chemical element 112 (temporarily named ununbium) proposed to the International Union of Pure and Applied Chemistry that its permanent name be “copernicium” (symbol Cn). “After we had named elements after our city and our state, we wanted to make a statement with a name that was known to everyone,” said Hofmann. “We didn’t want to select someone who was a German. We were looking world-wide.” On the 537th anniversary of his birthday the official naming was released to the public. Only mild controversy (and no fierce sermons) was the immediate result of the publication of Copernicus’ book. At the Council of Trent neither Copernicus’ theory nor calendar reform (which would later use tables deduced from Copernicus’ calculations) were discussed. The first notable to move against Copernicanism was the Magister of the Holy Palace (i.e., the Catholic Church’s chief censor), Dominican Bartolomeo Spina, who “expressed a desire to stamp out the Copernican doctrine”. But with Spina’s death in 1546, his cause fell to his friend, the well known theologian-astronomer, the Dominican Giovanni Maria Tolosani of the Convent of St. Mark in Florence. Tolosani had written a treatise on reforming the calendar (in which astronomy would play a large role), and had attended the Fifth Lateran Council to discuss the matter. He had obtained a copy ofDe Revolutionibus in 1544. His denouncement of Copernicanism appeared in an appendix to his work entitled On the Truth of Sacred Scripture. Some astronomical hypotheses at the time (such as epicycles and eccentrics) were seen as mere mathematical devices to adjust calculations of where the heavenly bodies would appear, rather than an explanation of the cause of those motions. (As Copernicus still maintained the idea of perfectly spherical orbits he relied on epicycles). This “saving the phenomena” was seen as proof that Astronomy and Math could not be taken as a serious means to determine physical causes. Holding this view, Tolosani invoked it in his final critique of Copernicus, saying his biggest error was that he started with “inferior” fields of science to make pronouncements about “superior” fields. Copernicus had used Mathematics and Astronomy to postulate about Physics and Cosmology, rather than beginning with the accepted principles of Physics and Cosmology to determine things about Astronomy and Math. In this way Copernicus seemed to be undermining the whole system of the philosophy of science at the time. Tolosani held that Copernicus had just fallen into philosophical error because he hadn’t been versed in physics and logic – anyone without such knowledge would make a poor astronomer and be unable to distinguish truth from falsehood. Because it had not meet the criteria for scientific truth set out by Thomas Aquinas, Tolosani held that Copernicanism could only be viewed as a wild unproven theory. Tolosani recognized that the Ad Lectorem preface to Copernicus’ book wasn’t actually by him. Its thesis that astronomy as a whole would never be able to make truth claims was rejected by Tolosani, (though he still held that Copernicus’ attempt to describe physical reality had been faulty), he found it ridiculous that Ad Lectorem had been included in the book (unaware that Copernicus hadn’t authorized its inclusion). Tolosani wrote “By means of these words , the foolishness of this book’s author is rebuked. For by a foolish effort he tried to revive the weak Pythagorean opinion , long ago deservedly destroyed, since it is expressly contrary to human reason and also opposes holy writ. From this situation, there could easily arise disagreements between Catholic expositors of holy scripture and those who might wish to adhere obstinately to this false opinion. We have written this little work for the purpose of avoiding this scandal.” Tolosani declared “Nicolaus Copernicus neither read nor understood the arguments of Aristotle the philosopher and Ptolemy the astronomer.” He wrote that Copernicus “is very deficient in the sciences of physics and logic. Moreover, it appears that he is unskilled with regard to holy scripture, since he contradicts several of its principles, not without danger of infidelity to himself and the readers of his book. …his arguments have no force and can very easily be taken apart. For it is stupid to contradict an opinion accepted by everyone over a very long time for the strongest reasons, unless the impugner uses more powerful and insoluble demonstrations and completely dissolves the opposed reasons. But he does not do this in the least.” He declared that he had written against Copernicus “for the purpose of preserving the truth to the common advantage of the Holy Church.” Despite the efforts Tolosani put into his work it remained unpublished and it “was likely shelved in the library of the Dominican order at San Marco in Florence, awaiting its use by some new prosecutor” (it is believed that Dominican Tommaso Caccini read it before delivering a sermon against Galileo in December 1613). It has been much debated why it was not until six decades after the publication of De revolutionibus that the Catholic Church took any official action against it, even the efforts of Tolosani had gone unheeded. Proposed reasons have included the personality of Galileo Galilei and the availability of evidence such as telescope observations. The sharpest point of conflict between Copernicus’ theory and the Bible concerned the story of the Battle of Gibeon in the Book of Joshua where the Hebrew forces were winning but whose opponents were likely to escape once night fell. This is averted by Joshua’s prayers causing the sun and the moon to stand still. Martin Luther would question Copernicus’ theory on these grounds. According to Anthony Lauterbach, while eating with Martin Luther the topic of Copernicus arouse during dinner on 4 June 1539 (as professor George Joachim Rheticus of the local University had been granted leave to visit him). Luther is said to have remarked “So it goes now. Whoever wants to be clever must agree with nothing others esteem. He must do something of his own. This is what that fellow does who wishes to turn the whole of astronomy upside down. Even in these things that are thrown into disorder I believe the Holy Scriptures, for Joshua commanded the sun to stand still and not the earth.” These remarks were made four years before the publication of On the Revolutions of the Heavenly Spheres and a year before Rheticus’ Narratio Prima. In John Aurifaber’s account of the conversation Luther calls Copernicus “that fool” rather than “that fellow”, this version is viewed by historians as less reliably sourced. Luther’s collaborator Philipp Melanchthon also took issue with Copernicanism. After receiving the first pages of Narratio Prima from Rheticus himself, Melanchthon wrote to Mithobius (physician and mathematician Burkard Mithob of Feldkirch) on October 16, 1541 condemning the theory and calling for it to be repressed by governmental force, writing “certain people believe it is a marvelous achievement to extol so crazy a thing, like that Polish astronomer who makes the earth move and the sun stand still. Really, wise governments ought to repress impudence of mind.” It had appeared to Rheticus that Melanchton would understand the theory and would be open to it. This was because Melanchton had taught Ptolemaic astronomy and had even recommended his friend Rheticus to an appointment to the Deanship of the Faculty of Arts & Sciences at the University of Wittenberg after he had returned from studying with Copernicus. Rheticus’ hopes were dashed when six years after the publication of De Revolutionibus Melanchthon published his Initia Doctrinae Physicae presenting three grounds to reject Copernicanism, these were “the evidence of the senses, the thousand-year consensus of men of science, and the authority of the Bible”. Blasting the new theory Melanchthon wrote “Out of love for novelty or in order to make a show of their cleverness, some people have argued that the earth moves. They maintain that neither the eighth sphere nor the sun moves, whereas they attribute motion to the other celestial spheres, and also place the earth among the heavenly bodies. Nor were these jokes invented recently. There is still extant Archimedes’ book on The sand-reckoner; in which he reports that Aristarchus of Samos propounded the paradox that the sun stands still and the earth revolves around the sun. Even though subtle experts institute many investigations for the sake of exercising their ingenuity, nevertheless public proclamation of absurd opinions is indecent and sets a harmful example.” Melanchthon went on to cite Bible passages and then declare “Encouraged by this divine evidence, let us cherish the truth and let us not permit ourselves to be alienated from it by the tricks of those who deem it an intellectual honor to introduce confusion into the arts.” In the first edition of Initia Doctrinae Physicae, Melanchthon even questioned Copernicus’ character claiming his motivation was “either from love of novelty or from desire to appear clever”, these more personal attacks were largely removed by the second edition in 1550. In Roman Catholic circles, German Jesuit Nicolaus Serarius was one of the first to write against Copernicus’ theory as heretical, citing the Joshua passage, in a work published in 1609-1610, and again in a book in 1612. In March 1616, in connection with the Galileo affair, the Roman Catholic Church’s Congregation of the Index issued a decree suspending De revolutionibus until it could be “corrected”, on the grounds that the supposedly Pythagorean doctrine that the Earth moves and the Sun does not was “false and altogether opposed to Holy Scripture”. The same decree also prohibited any work that defended the mobility of the Earth or the immobility of the Sun, or that attempted to reconcile these assertions with Scripture. On the orders of Pope Paul V, Cardinal Robert Bellarmine gave Galileo prior notice that the decree was about to be issued, and warned him that he could not “hold or defend” the Copernican doctrine. The corrections to De revolutionibus, which omitted or altered nine sentences, were issued four years later, in 1620. In 1633 Galileo Galilei was convicted of grave suspicion of heresy for “following the position of Copernicus, which is contrary to the true sense and authority of Holy Scripture”, and was placed under house arrest for the rest of his life. At the instance of Roger Boscovich, the Catholic Church’s 1758 Index of Prohibited Books omitted the general prohibition of works defending heliocentrism, but retained the specific prohibitions of the original uncensored versions of De revolutionibus and Galileo’s Dialogue Concerning the Two Chief World Systems. Those prohibitions were finally dropped from the 1835 Index.